Big day today. 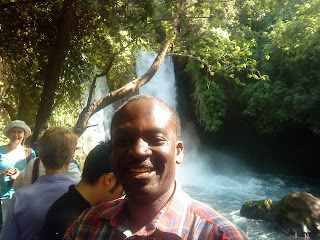 We were at the the Source of the Jordan and after a few places moved on to jerusalem. O Jerusalem. The Western wall, the last remain part of the old Jewish temple. (called sometimes the wailing wall) and the prayers and the orthodox Jews Wow wow and wow. It is awesome to think that Jesus came here quite a few times and taught, drove off money changers and quite a bit of drama leading to his eventual cruxifiction took place here. We visited the Western wall while it was still not filled with too many people, BUT our Jewish brothers mainly were there praying and meditating. Tables for study and books. Shaking their heads back and forth and close to the beginning of the Sabdath started to sing and increased the intesity. It’s Saturday. There is something about this Shabatt /Sabbath. It is very serious business here. It is REST for creative activity we learnt. Even Lifts are customised! You have the Shabatt lift that starts and goes to every floor without you having to select the floor you are cgoing to. Got back to my room after our outings and met an unmade bed in the hotel. Called reception and duh.. they nicely explained that it was shabatt! Today , after eating we headed for the Old city of Jerusalem again, got first to the mount of Olives (which is on the Arabic side while Mt. Scopus is on the Jewish side) and visited quite a few places: first stopping to take a group photograph. No mean feat with 200 plus people! Then I saw a panoramic view of the golden city, Breathtaking. It blows your mind. This is the city that is the source of lots of contoversy, is fought over and is a ‘holy city’ all in one.